I know Thanksgiving is tomorrow and I'm finally getting into the spirit! I was asked if I had ever created a basket for a baby shower or if I could. Of course, I said yes. The baby is due to be born on Thanksgiving day. Although, Thanksgiving is a special day for many of us, she wanted something specifically for her friend and the baby that kept the focus on her being a new and first-time mom. 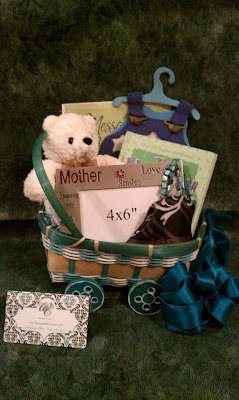 I completely understood and showed her a basket that I had done last year for a contemporary mom. I've always felt that some gifts at a babyshower should include some for the mom to use after the baby is born, since she's often and quickly forgotten about. With that being said, this basket included a book a stories for the mom-to-be to read to the baby in the nursery, an overall picture frame with a hanger and 12 spaces for the first year of the baby's life, a picture frame, a scrapbook of baby's special moments, a teddy bear, a blue bracelet, and a silk scarf.